Let us cast your sentimental, broken and unused gold jewelry into a Valuable Family Heirloom! Use the Contact link to ask any questions. Include your phone number if you want to speak to us! Shown above is an 18k Gold Winged Cross that we cast from a customers unworn gold jewelry that we refined and re alloyed. We can do the same with your gold. You can then have your local jeweler attach a bail of your choice and make a pendant from the cross. 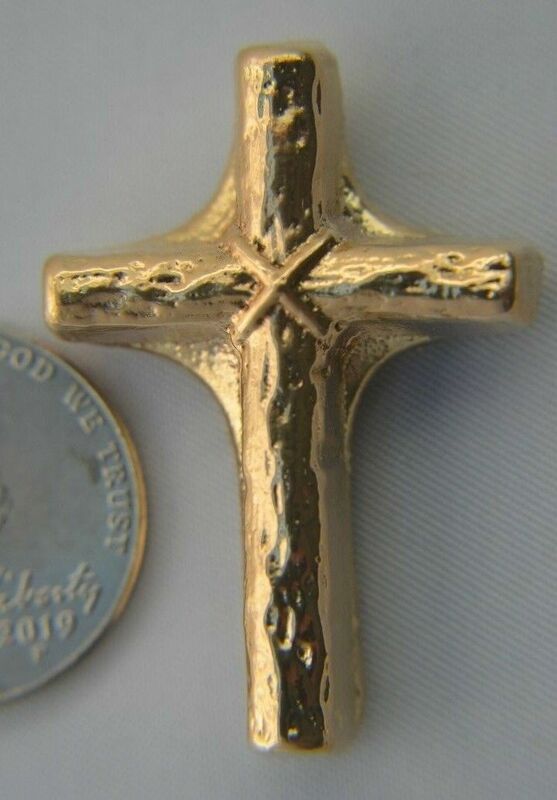 For us to make an un-winged Cross from your gold we need 17.25 grams of 10k for a 10k Cross, 19.55 grams of 14k for a 14k Cross, 21.85 grams of 18k for an 18k Cross and 25.3 grams of 22k for a 22k Cross. Print and mail us this Form with your gold today! Contact Us if you would like to purchase a similar Cross made from our gold. We can cast just about anything! Pendants, Solid Gold Cross, ancient coins, pirate coins, just about anything! The best part is that you pay nothing out of pocket! We charge a small 15 percent of the gold to pay for our refining, alloying and casting service. You receive a casting or castings worth much more than the gold that you sent! Contact Us! Send pics or drawings of what you want us to make for you. Include an approximate size. We will estimate the amount of gold that we need to make the item for you. We Buy Authentic Gold Nuggets! Contact Us for more information. Please include a phone number and best time to call.